PASADENA, Calif. — These Dawn FC (framing camera) images show part of Vesta’s equatorial region, which contains a prominent, deep impact crater (lower center of image) and large troughs (linear depressions). The various colors correspond to the height of the area that they color. For example, the white areas in the bottom corners of the image are the highest areas and the blue areas along the top of the image are the lowest. The prominent impact crater is set into a topographically high area defined by the red and white color-coding. Above this area there are a number of deep troughs represented by green and blue color-coding. A conspicuous trough on the left, which looks like it could be quite deep in the albedo image, is shown by the color-coding in the topography image to be only a little shallower than the area surrounding it. 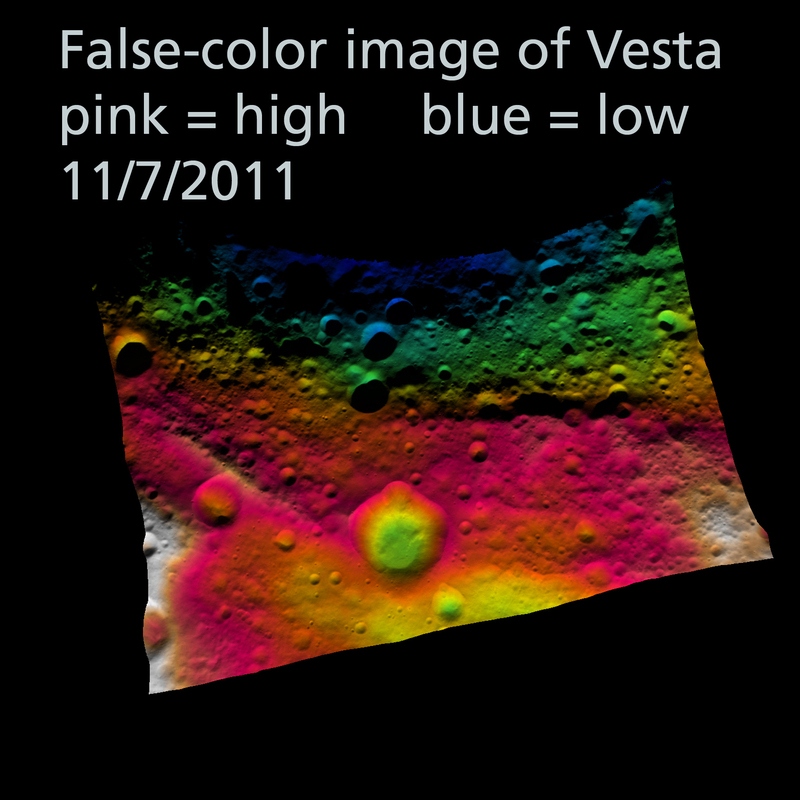 This is a standard terrain image with rainbow colors corresponding to elevation. Pink and white are high elevations, blue and green are low. There’s a weirdness in this one though – the colors go in this order: blue, green, yellow, orange, pink, brown, white. Orange and brown look almost the same. My favorite feature here is the line running up to the left from the big crater in the middle. Due to the weirdness with the scale, I can’t tell if this is a ridge or a valley. What do you think? I have an e-mail out to JPL. Of Interest: This eastward-looking image shows a wider view of the beautiful unnamed crater highlighted in yesterday’s featured image (center). The complicated folds and fractures that deform the once smooth floor of the Caloris basin can also be seen. This image was acquired as a high-resolution targeted observation. Targeted observations are images of a small area on Mercury’s surface at resolutions much higher than the base maps. 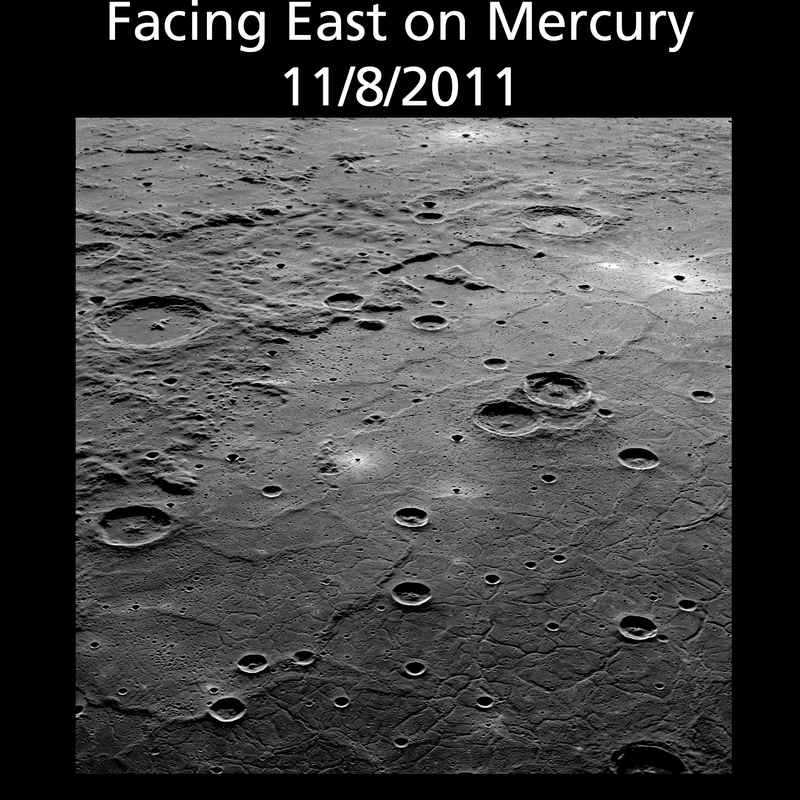 It is not possible to cover all of Mercury’s surface at this high resolution during MESSENGER’s one-year mission, but several areas of high scientific interest are generally imaged in this mode each week. If this image doesn’t take your breath away I can’t help you. Those craters look like raindrops in a puddle to me. This picture is so beautiful. Mercury looks like a PLANET here, not just a desolate collection of black-and-white photos. Of note: the bright areas are not highlights, they are crater rays – new dirt (“regolith”) kicked up by recent impacts.